Valentine’s Day promotion: Get a Free Gift Box & Wrapping! Our Editors picked twelve jewels that all girls will love (all on the shop's homepage), but you know your Lady better than we do, so you may end up choosing something more extravagant or precious from our beautiful pearl collection. In any case, we will help you to put final touches to your gift. 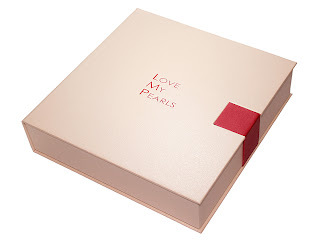 If you are buying a Valentine’s Day pearl jewelry gift with our help, until February 14, you can receive one of our gorgeous gift boxes and a pretty gift wrapping for free! All you have to do is to type “Valentine’s Day Gift” into the comment area during your order checkout. Simple as that! Valentine’s Day… Oh, what a day! It is supposed to be the most romantic, breath-taking, knee-bending day of the year. Lovers all over the world will be exchanging cute cards, meaningful gifts, and nice words, girls will put on their most seductive dresses, and men… well, as we speak, they are trying to figure out what kind of gesture would be the best for the occasion. I thought I would make it easier this year for any men with doubts and prepare a simple guide on how to please their woman for Valentine’s Day. How do I achieve this? 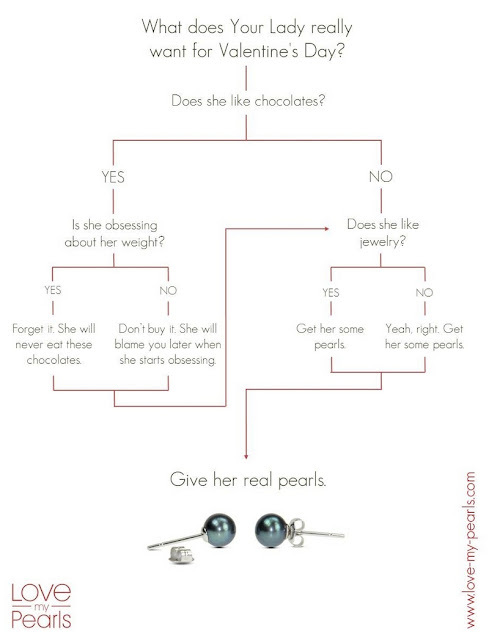 Well, there is nothing more appealing to most guys than the ease and simplicity of a decision-making… flowchart. Here it is. Enjoy and feel free to share it with others! Click on the picture for a higher resolution! It struck me in the car. We were driving with my sister-in-law on the last day of our beautiful holiday and talked about all the wonderful gifts we received for Christmas this year. “We are all so very silly” she was saying. “Look at all these great earrings, rings, and pendants we just gave each other. Don’t we wish they came from our men?” She was right. Why is it that most women expect their significant other to read their minds and get them the jewels of their dreams? True, between girls we are able to pick jewelry to suit each other’s tastes with close to 100% certainty. True, we all got each other jewelry because we were pretty sure our men would probably not take that step and choose for us trendy brushed gold cocktail rings or Art Nouveau-inspired dangly earrings. The fact is, despite our desperate acts of leaving Vogue or Elle open on the page with the jewel of our heart’s desire, men often miss our subtle signs and outright ignore our literary hints. Dear Ladies, we were raised this way, by television, movies, and books. We expect to be given beautiful jewels, regardless of their price, just because Danielle Steel says we should. Yet we should not forget that gifts like these carry a heavy emotional load. Rings have a particular significance to many of us - especially men. They imply a wish to deepen a relationship. Such social taboos mean that jewelry gifts are often chosen with extreme care after having considered possible hidden meanings and their maybe complicated implications. Must we be stuck waiting, then? Not at all! Many of you probably already know the answer. 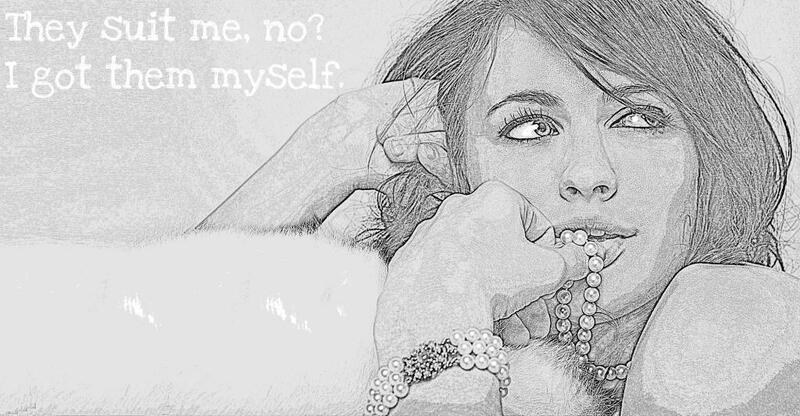 Let’s buy our own jewelry! Imitation or real, new or old, cheap or expensive. Let’s fight, from time to time, this guilty feeling of “I shouldn’t, they are not essential to my survival”. 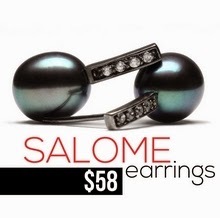 Let’s stop visiting our favorite pieces at the local jeweler’s or in the online store. They don’t need our visits and sighs; they need to adorn our pretty fingers, slender necks, and cute ears. Let’s build breathtaking jewelry collections for our daughters the way WE want them.